Jefferson Davis Parish, La. – The reward to find the suspects in a cattle shooting that happened in Jefferson Davis Parish has been increased. 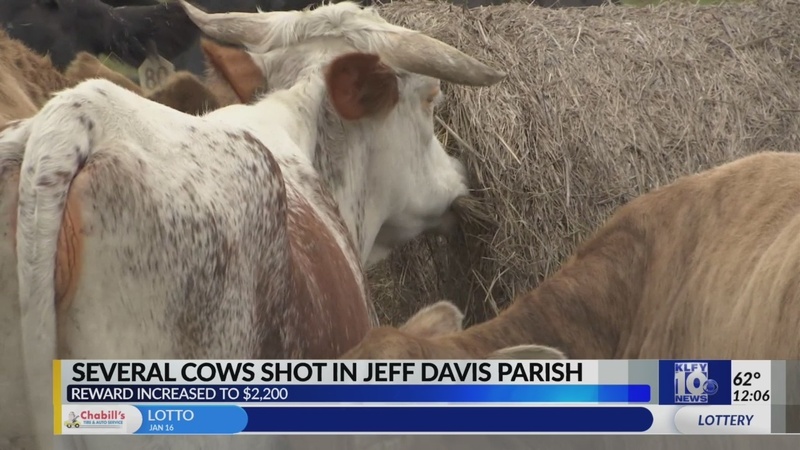 The Louisiana Department of Agriculture and Forestry (LDAF) Livestock Brand Commission and the Jefferson Davis Parish Sheriff’s office are offering a reward of up to $2,200 for information that leads to the arrest and conviction of the individual(s) responsible for shooting five Brangus cows in Jefferson Davis Parish. "The Jefferson Davis Parish Cattlemen's Association is adding $200 and Lake Charles farmer, Callen Odom, is adding $1,000 towards the reward for a total of $2,200," Agriculture and Forestry Commissioner Mike Strain, D.V.M., said. Jefferson Davis Parish Sheriff Ivy Woods said, "Detectives are working with Livestock Brand Commission agents on this incident and hopefully someone will come forward with information that leads to capturing the persons involved in this crime." Investigators said five cows were shot in the head on Sunday, Jan. 13 in a pasture off of Faul Road and Lone Pine Road, north of Welsh with a small-caliber weapon. The animals are expected to recover from the injuries. Anyone with information on this crime is urged to call Livestock Brand Commission Crime Stoppers at 1-800-558-9741 or the Jeff Davis Sheriff’s office at 337-821-2100. All calls are anonymous and you could earn up to a $2,200 cash reward for information which leads to the arrest and conviction of the person or persons responsible for the crime.